Photo: Fredrick Dryden and Sharon Clark in Ottawa last week supporting and raising awareness for vulnerable youth. Some of the books were given to the Department of Justice, Operation Come Home, and MPs at a round table discussion. 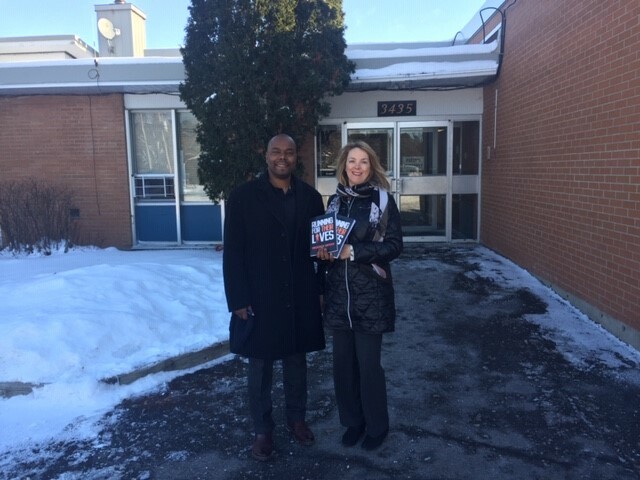 The Hamilton Port Authority (HPA) has purchased the first 100 copies of Fredrick Dryden’s new book Running for Their Lives and has donated the books back to Liberty for Youth (LFY) so they can be given out to individuals and youth in the community – just in time for Giving Tuesday. Running for Their Lives tells the story of Fredrick Dryden, LFY Founder and Executive Director. The book not only details his 650 km run from Hamilton to Ottawa in 21 days, but also his early years, how LFY came to be and the important work that LFY is doing to help at-risk youth. HPA has been supporting the work LFY does in our community since 2011 with almost $100,000 in donations. This past year, LFY was one of the organizations chosen for HPA’s annual fundraising golf tournament. $21,000 was raised for LFY and some of the youth were in attendance to help out and share their stories. HPA was also the presenting sponsor of this year’s Power of a Changed Life fundraising gala. HPA’s support for LFY includes the involvement of port employees. A number of staff members run alongside Fredrick in the annual Road2Hope marathon to help generate awareness and support. In addition, Sharon Clark, Community Relations Manager at HPA, is campaign chair of LFY’s ‘Run for Youth’ fundraising campaign. This three-year campaign launched in 2016 began with Fredrick’s 650 km run. The goal of the campaign is to bring awareness of the challenges at risk youth face, and to fundraise $650,000 to achieve program sustainability at LFY. Now in the final months of the campaign, LFY is only $30,000 away from its goal. Founded in 2004 and supported through a network of donors, funders, volunteers, staff and community partners, Liberty for Youth is a not-for-profit charitable organization that provides a prevention and intervention mentoring program aimed at youth, ages 12 to 25, living in the Hamilton and surrounding areas, who are involved in, or at-risk of criminal behaviour.